Too many new drug compounds fail in late-stage clinical trials due to inefficacy and safety concerns. With often-cited costs of $800 million to bring a new drug to market, a compelling need exists for improved early-stage screening. Insufficient knowledge of potential human toxicity can turn a promising lead candidate into a devastating loss. Emerging technologies that will change the existing paradigm were highlighted at Mondial Research Group’s recent conference on “Predictive Human Toxicity and ADME/Tox Studies (Absorption, Distribution, Metabolism, Elimination, and Toxicity)”. Just like humans with their individual characteristics such as age, weight, and height, calculated molecular descriptors (e.g., number of atoms, molecular weight, shape, and other parameters) quantitatively describe molecular structures. Simulations Plus’ ADMET Predictor software mathematically correlates measured chemical-compound properties with their molecular descriptors to build predictive models. Currently, the application offers 133 predictive models and can process approximately 200,000 compounds per hour on a personal computer, Dr. Fraczkiewicz explained. In silico usage is only widespread for a few select properties that have had long-time usage as primary indicators of potential new molecule druggability such as logP predictions (octanol-water partition coefficient), Dr. Fraczkiewicz noted. LogP predictions measure molecular hydrophobicity, which affects drug absorption, bioavailability, hydrophobic drug-receptor interactions, and may affect toxicity. Current ionization, solubility, and permeability predictors range from simple equations to sophisticated, and quite accurate, artificial-neural-network ensembles such as the models implemented in ADMET Predictor, which are based on a combination of molecular and atomic quantum-level descriptors. “Today, many in silico predictions have the same margin of error as their in vitro counterparts. We will not likely ever eliminate the need for in vitro or in vivo experiments for all molecules, but better in silico models can allow focusing the resources for these experiments where they are truly needed,” concluded Dr. Fraczkiewicz. Medicyte says that its upcyte technology addresses the major drawbacks in using primary cells for high-throughput screening campaigns. 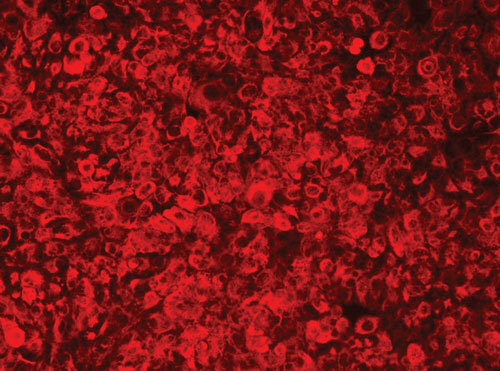 (a) Brightfield image of upcyte hepatocytes transduced with a selected set of genes for proliferation, which do not induce immortalization. Assays using primary cells, which represent in vivo physiology better than immortalized cell lines, can provide more accurate predictions of in vivo compound activity. “You can get false negatives and false positives from cell lines that are not primary cells,” advised Nicola Hewitt, Ph.D., scientific consultant, Medicyte. Medicyte’s upcyte® technology addresses the major drawback in using primary cells for high-throughput-screening campaigns—that is, the difficulty in obtaining the needed number of cells. “With our proprietary technology we identified genes that can induce and maintain proliferation of primary cells, circumventing the natural barrier points. Using a lentiviral gene-transfer system, we achieved effective transfer of these genes into human primary cells. These genetically engineered upregulated primary cells, termed upcytes, can be passaged for at least an additional 20 to 40 doublings. Up to 1,800 vials, containing 6 x 106 cells each, can be obtained from one vial of primary cells,” explained Dr. Hewitt. With the ease-of-handling of cell lines, upcyte cells display the stable, normally differentiated phenotypes of primary cells. Cells from multiple donors provide experimental breadth early in the testing process. 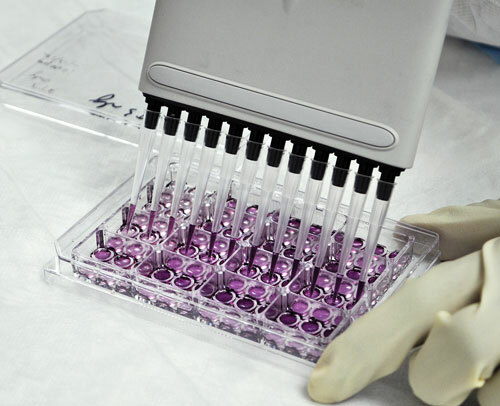 Quality control consists of cell characterization at predetermined stages of proliferation. For example, upcyte hepatocytes are tested for expression of adult cell markers, the Dkk3/REIC gene (Reduced Expression in Immortalized Cells), glycogen storage, albumin and urea secretion, and inducible enzyme activity. CYP3A4, one of the most important enzymes involved in the in vivo metabolism of xenobiotics, is a major target for many drug compounds. Inhibition of CYP3A4 by 10 mN ketoconazole decreases aflatoxin B1 toxicity similarly in primary cells and upcyte hepatocytes from multiple donors. Additional screening tests using compounds with a range of toxicity correlated well with in vivo hepatotoxicity. (b) Immunofluorescence techniques confirm that the adult specific markers, a-1-antitrypsin, cytokeratin 8 (example shown), and cytokeratin 18, are present; and the fetal marker, a-fetoprotein, is absent from confluent monolayers of upcyte hepatocytes. Thought to be responsible for 30 to 40% of previously undetected clinical tolerance problems resulting in cardiac and drug-induced liver injury (DILI), mitochondrial liability identification has become a prerequisite to IND submission for antivirals and is recommended by the FDA and the EMA for preclinical DILI anticipation. “To identify mitochondrial liabilities with existing tests, you need four different screens using different models and different technologies with different sensitivities, which makes interpretation difficult and untranslatable site-to-site,” says Nathalie Compagnone, CEO, ICDD-sas. Mitosafe® is a series of mechanistic-based, preclinical-screening technologies that quantify bioenergetic balance, redox (reduction-oxidation), and mitochondrial DNA depletion statuses, the main biological aspects that a drug affects in the mitochondria. This balanced assay measures both anatomic and functional outcomes, identifying mitochondrial liabilities. Inventors of the concept of mitochondrial behavior, ICDD-sas evaluates 48 parameters on living primary cells to quantify and qualify mitochondrial behavior. Adverse drug reactions can be forecast with 83% predictivity and >90% sensitivity and specificity. The Mitostream technology, an experimental-system-biology predictive tool validated by the Drug Safety Executive Council and numerous pharmaceutical companies, is applied typically at the lead candidate level. Mitostream technology, which measures the cell adaptability in response to a drug, has proven effective in predicting clinical tolerance and is used for managing clinical trials. “Even though the ultimate effect of a drug may be toxicity to a certain organ, there are internal organ intra-actions going on. Almost all compounds are metabolized by the liver; the lack of hepatic metabolism has been one of the major barriers that in vitro systems have needed to overcome to replace in vivo animal testing. If you tested a drug only on one type of cell, such as kidney, neuron, or heart cells, which do not metabolize drugs well in the absence of the liver, then it is possible to either overstate or understate toxicity. We need to be able to test new chemical entities in a physiologically relevant human in vitro system to provide a much clearer picture on human drug toxicity, with the inclusion of hepatic metabolism as one of the key components,” explained Albert Li, president and CEO, APSciences and In Vitro ADMET Laboratories. The patented Integrated Discrete Multiple Organ Culture plate (IdMOC™) provides a method to model in vivo multiple-organ interaction in vitro. The standard-sized plate consists of multiple inner wells within a larger interconnecting chamber. Multiple cell types are individually cultured in the inner wells as physically separated, discrete entities, and the chamber is filled and integrated with a single, universal medium, flooding the wells and allowing well-to-well communication by diffusion. A basic assay established proof of concept that exposure to hepatocytes is necessary for correct quantification of drug metabolism. Hepatocytes and reporter cells, cells without strong metabolism capabilities such as 3T3 cells, were co-cultured in different wells and exposed to cyclophosamide, which is only toxic after metabolism. As more wells of hepatocytes were added to the IdMOC plate, toxicity increased, demonstrating that toxicity was dependent on the amount of hepatic metabolism. Metabolism-dependent immunotoxicity was also shown using cyclophosphamide, which was found to be relatively noncytotoxic to splenocytes but was cytotoxic to splenocytes in the presence of hepatocytes. APSciences’ IdMOC plate consists of multiple, inner wells within a larger interconnecting chamber. 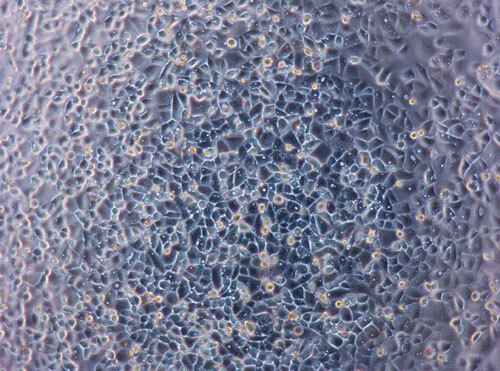 Multiple cell types are individually cultured in the inner well and the chamber is filled with a single, universal medium, allowing well-to-well communication. The overlying medium can be analyzed for test material metabolism, and individual cell types can be evaluated for possible organ-specific bioaccumulation, cytotoxicity, and efficacy, according to the company. “To date, there is no in vitro system that simulates the liver’s complexity from in vivo sinusoid-like structures to perfusion-mimicking physiologic conditions of the blood flow within the sinusoidal network. With the expectation that culturing hepatocytes under in vivo-like conditions will result in in vivo-like cell functionality, and resultant response to drug stimuli, we established the HepaChip® concept, a liver-cell culturing approach that combines a plug-and-play microfluidic device with liver-like artificial sinusoids,” explained Jan Böttger, University of Leipzig. The microscope-slide-sized HepaChip features a system of branching microchannels and cell culture chambers with parallel cell-assembly ridges located in the middle of the chamber, approximately the dimensions of sinusoidal structures in the human liver. Built-in flow barriers reduce flow velocity and shear forces. To create the artificial sinusoids, positive dielectrophoresis, via application of an AC electric field, directs hepatocytes and liver endothelial cells toward the assembly ridges. The surfaces of the cell chambers are modified to enable optimal cell adhesion that imitates the natural liver. Proof of concept was shown using cryopreserved human hepatocytes and human liver endothelial cells and also with primary mouse hepatocytes and human liver endothelial cells. Slender lucid spaces between hepatocytes indicated the formation of bile canaliculi, an indicator of reestablished cell polarity, a function typically not well established in standard two-dimensional liver-cell cultures. HepaChip cultures also demonstrate improved liver-specific metabolic functions, in particular the secretion and biotransformation of albumin and urea by phase I cytochromes, P450 3A4 and 1A2, and phase II enzymes, UGT and SULT.